The New York chapter of the transnational feminist group AF3IRM celebrates International Working Women’s Day with a report-back featuring member and award-winning author, Ninotchka Rosca on March 8, 3:30-5:30 PM, at the University Settlement in Manhattan. In honor of the working women and also to learn more about how women and children are disparately impacted by sexual violence in the aftermath of military conflicts and natural calamities like Typhoon Haiyan, AF3IRM has created this public forum. Rosca shares her findings and experiences during her three-week trip to the Philippines, with national chair, Jollene Levid. Levid had conducted a similar talk-back in San Francisco last week. Both Rosca and Levid visited Tacloban and surrounding villages, which were ravaged by the super typhoon last year, and further south to Zamboanga City, where thousands of people were displaced due to the ongoing conflict between the military and the Moro National Liberation Front. The research is part of PHASE 1 of AF3IRM’s joint sexual violence relief centers project with the National Association of Asian and Pacific Islanders Ending Sexual Violence (NAPIESV). This relief project aims to provide emergency shelters, counseling, medical services, and recovery programs to victims of sexual violence and trafficking in disaster-prone areas in the Philippines. 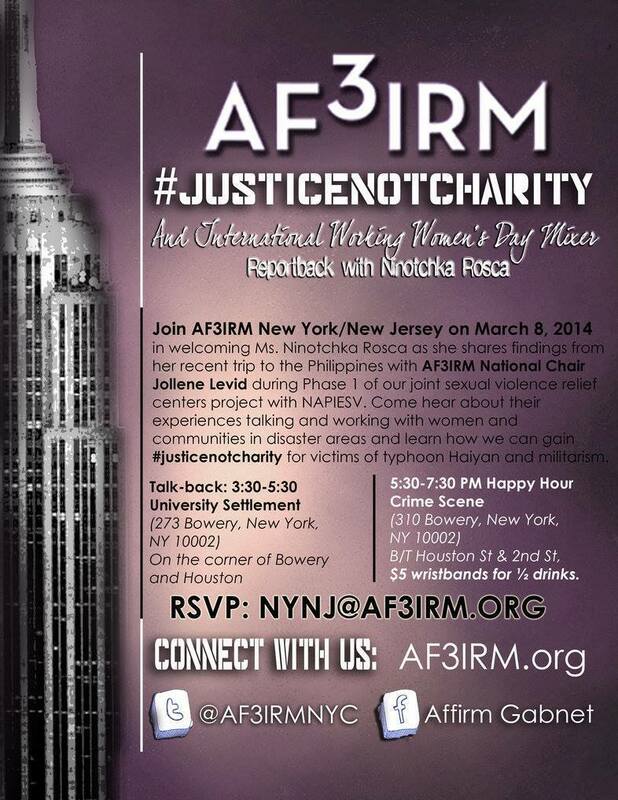 AF3IRM will continue to share these stories and seek justice for the affected, not charity. The report-back will be followed by a mixer, at 5:30-7:30 PM, where the attendees can unwind and continue informal discussions with the speaker. $5 wristbands for ½ drinks.